And sandal season is finally here!!! Don't know for how long, but I will enjoy every day of it. On wednesday, I'm going to Vienna for fashion night... can't wait to share some instagram pictures with you! Is anyone going? Ohh, I love, love, love your outfit! You look gorgeous! You look adorable Ileana, I like red on you! The flats and the cardigan are so cute! Happy Sunday, kisses! what a cute outfit :) you look so pretty! Superb! You always give us the most perfect inspiration Ileanna. Such a pretty top and jacket! Wow ... I love red!!!!! And your look is very cool!!!! great look honey, i really love it because my favourite colour is red! I absolutely adore this outfit, you look so radiant in red hun!..Thanks for sharing your fashion opinions with me...May this week be a great one for you! 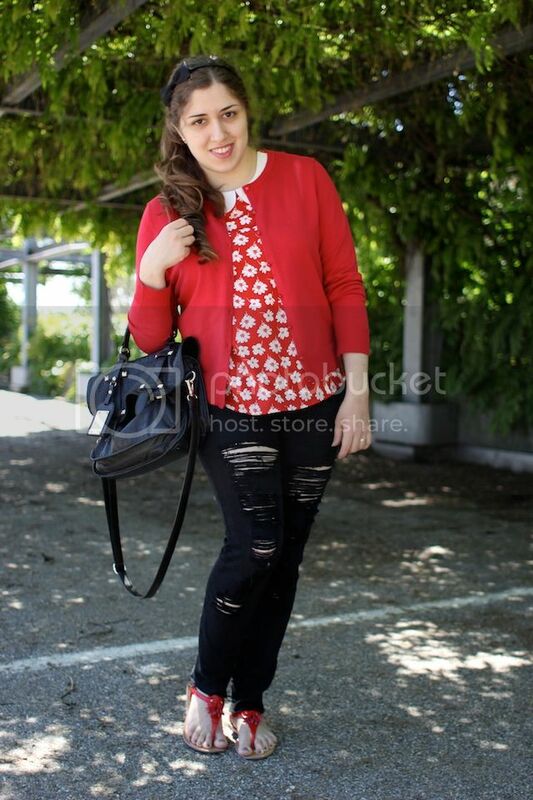 You look so pretty in red - love the flower print shirt and your jeans! ¡Me intriga ver tus looks de primavera/verano! ¡Besos! cute blouse and conformtable look to go out on a walk. love the destroyed denim! xO! You look great, love your red combo. Me enamore de la cartera! genial todo el conjunto, te felicito! Besos! Love the blouse and the cardigan :) so cute! Cute blouse - Love the Peter Pan collar. You look so pretty in red. the perfect combination of rock and romantic! Lovely top, you are cute! Super pretty outfit! Love all the red pieces, especially that top & those sandals! How pretty the floral top is! Hi sweety, stopping by to say 'hi'! I'm really happy about sandal season as well! Love this outfit, the shirt is so cute! Love the print. Beautiful look, I love your top and sweater! So cute! Also love your hair! Your sandels are so cute. Por cierto, se me había olvidado decirte que me dio mucha risa lo que te paso con el sorteo y los papelitos al practicar jajajaja.... otra vez yo! P.D. : como le hiciste para agregar el Pin It a tus fotos? This outfit is so perfectly sweet! 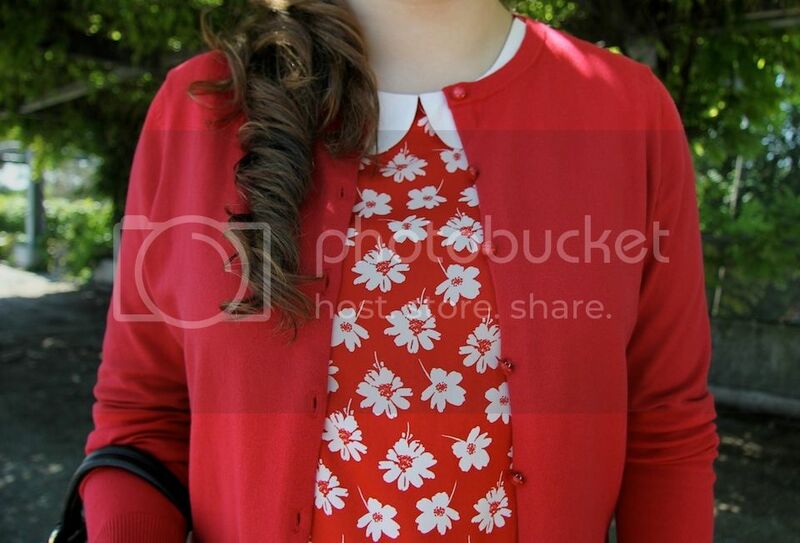 I love your red printed blouse with the cute collar! Your bow headband is just wonderful! I know, sandal season finally started!! I was really getting fed up with socks. I really like your flats, babe, great color. ;) Have fun at the event!! 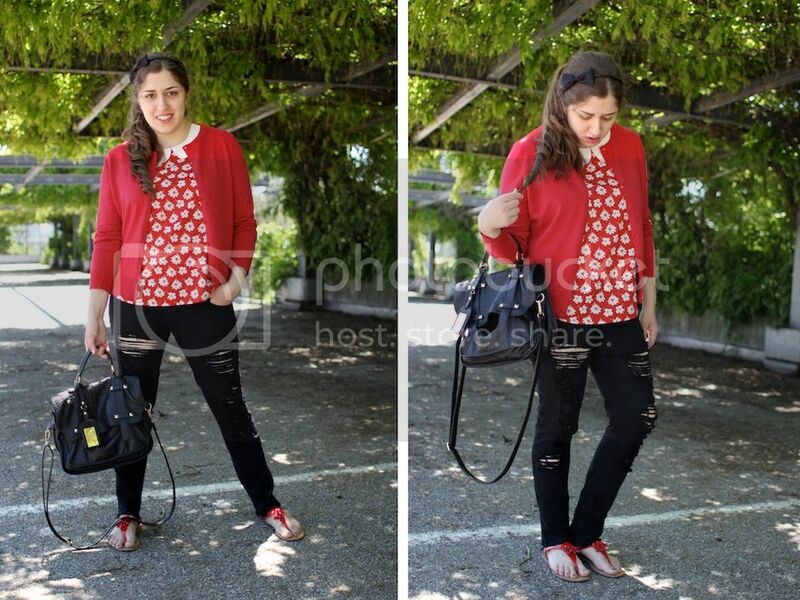 The red top works so well with the red cardy and black jeans! Such a tailored and retro combo! 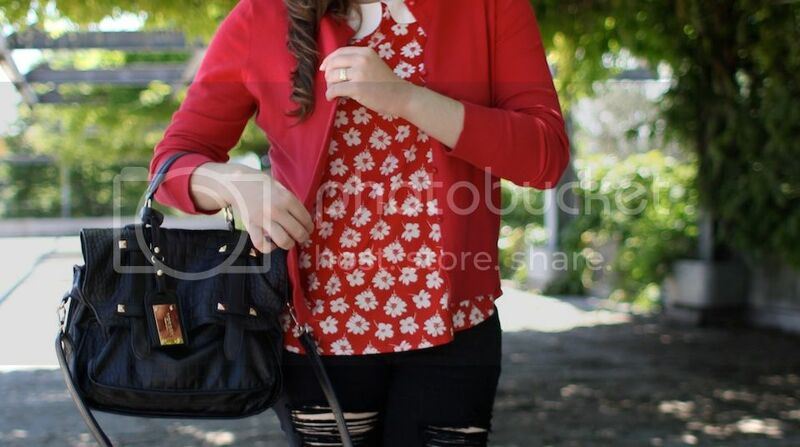 Enamorada de este conjunto, me parece tierno y chic, aparte que el rojo es de mis colores favoritos para vestir. Love red! probably my favourite shade! yeah! sandal season!! i had a few days last week but is raining again :( I don’t know where the summer has gone! You probably in Vienna now! good luck hun! Lovely look. I love that you paired red with black! I love the purse so much! Lovely red blouse and sweater. Looks good on you. I love your outfit. Especially the red jacket and top!